Before the term food stylist was introduced in the 1950s, my job was called home economist, and the people doing it were women working in test kitchens for women’s magazines and food companies. When adds changed from illustrations to pictures, the name of the job also changed. However, here in Spain there’s not a Spanish word for my job, so they choose to call it…. home economist. Funny people. Here’s a little recipe of my lunch yesterday. 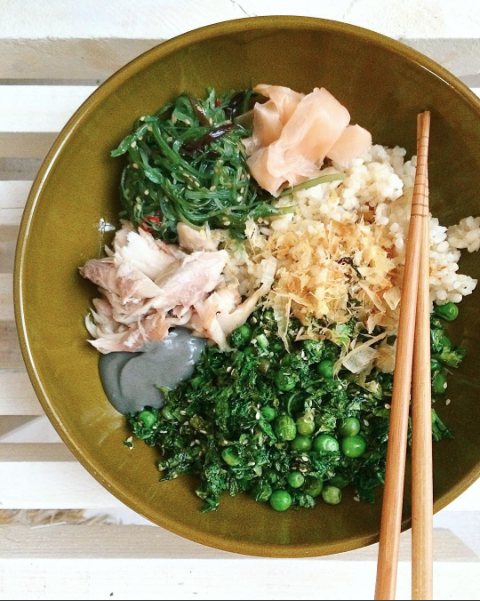 I almost always have cooked rice and leafy greens in the fridge, so bowls like these are super easy to whip up! Chop the greens and melt the ghee in a skillet. Sauté the greens until slightly wilted and add the peas. Toss and add the soy sauce and sesame seeds. Make up your pretty bowl by placing all ingredients side by side, and dig in!